Interests - Dinosaurs - whether models, books or videos he can name most of the dinosaurs and loves them dearly. He is a great little artist and he enjoys playing on the computer. He also likes Ben 10 and Michael Jackson. Ethan and his family are Catholics. Ethan was born full term, a healthy looking 7lb 12oz. It was several days after, his breathing seemed difficult, and he sounded like a dove cooing. Ethan then developed a cold; he went into hospital but was discharged. It took numerous admissions and a cardiac arrest before a diagnosis was made, of congenital subglottic stenosis, a rare condition. His windpipe was like an hour glass, he required urgent transfer to GOSH in London and a tracheostomy was performed at 11wks of age. 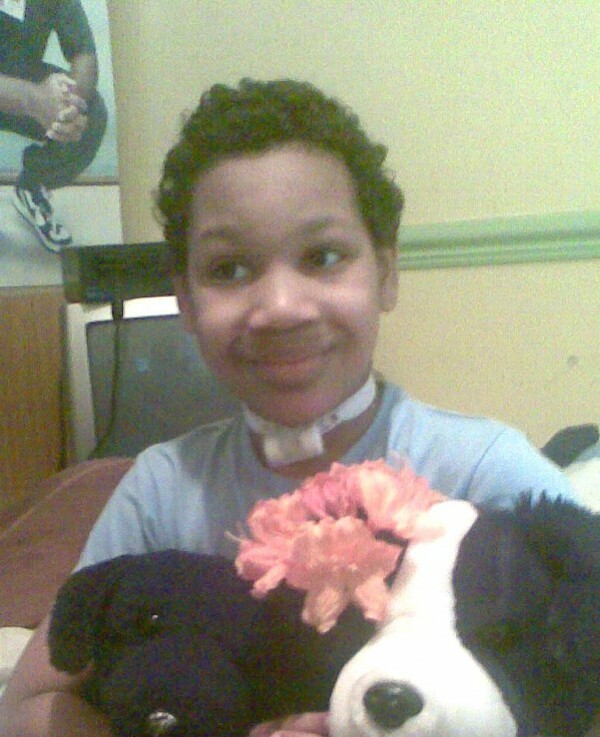 Once the tracheostomy was placed in his throat his voice was lost, he became silent. There were tears and expressions but no sound. He was allowed home three months later with a team of nurses, they took over care needs throughout the night. It was a difficult fifteen months that followed, with numerous hospital admissions and 1 wk before Ethan was due for reconstructive surgery, he had a respiratory arrest at home and was admitted into hospital. He was shown to have pneumonia and he required intensive intravenous antibiotics but he made surgery. Ethan underwent a long procedure to rebuild his airway using a piece of rib bone, the tracheostomy was taken away. After about 13 days he came home. I was reluctant to take him home as his noisy breathing had returned, but was forced to anyway. I contacted the ward that night as Ethan was distressed and struggling to breath, they advised calpol be given and refused readmission to the ward. Ethan suffered a full cardiac arrest at home, I gave mouth to mouth and called the emergency services, the ward did not believe he had arrested but said he had fainted. He remained on the ward that night. I was distraught, the Dr had advised the nurses that Ethan was not in any danger, how ever during a nappy change he was laid flat, cried and went into another cardiac arrest. He was intubated and sedated and taken to PICU, then to the theatre where they discovered his airway had collapsed, the rib cartilage had come away. A second tracheostomy was performed. He was later transferred back to GOSH, where a second reconstructive surgery took place, but the tracheostomy was left in, and a stent was inserted to support the rib cartilage for 6 months. He remained an inpatient during this time and suffered further respiratory and cardiac arrests on the ward, totalling at least fifteen. He was also diagnosed as MRSA positive. Treatment was futile whilst the tracheostomy was in place, how ever Ethan was kept on a main ward and not barrier nursed by staff to prevent further cross infection. After 6 months the stent was removed but surgery showed although the repair was successful his airway had collapsed in different place, and his vocal cord had been damaged. Although Ethan was still mute he had learnt makaton sign language, he could communicate. In total, Ethan had then spent over a year in hospital. I requested a break from theatre and time at home and it was agreed if I accepted full responsibility for him, as he was tracheostomy dependant and this made him vulnerable to further arrests. A local charity The Caudwell Charitable Trust agreed to buy Ethan an electronic hand held voice, using pictures and buttons and he learnt to speak, using buccal speech- incredible. Now after over two years in silence he was talking, it was difficult to understand at first but with practice I learnt to understand and he became clearer. He also has a delayed swallow trigger, so fluids leak to his lungs. He is on daily course of antibiotic to protect his lungs, this cannot be repaired and the prognosis is still unclear. He requires a further reconstructive surgery to repair the collapse just above his tracheostomy, he has been extremely brave and he still has his nurses attending to his care needs through the night. Ethan is in school now, he goes to a special needs school. He is coming on in leaps and bounds, but he does still lose time in school due to his repeated chest infections and gets tearful because he can’t have sleepovers with his friends. Unfortunately, due to his condition, he can not stay away with friends and due to their illness they can not say away from home either. However, his brother and sister do have friends over and include Ethan as much as possible; this makes him feel like he has had company too. There is a new medical procedure being used to correct Ethan’s airway, balloon dilation, and his surgeon is confident this could work for Ethan. We are going to theatre on Sept 22nd, I am extremely cautious of this but Ethan’s needs must out way my fears, fingers crossed this time. With regards to the MRSA status, Ethan has tested negative. A hospital spokes person said he must of developed his own immunity to it, as he has had no treatment for it. I think this is incredible and must give hope to many other people who are MRSA positive, it can be beaten. Ethan has overcome such serious problems and emergency situations; I am not surprised he took on MRSA and won that battle too. To end I would like to add that as his mother, I am so proud of him and admire his courage and strength. We have a long road to travel yet, as even if the tracheostomy is successfully removed, he still has the aspiration to his lungs of fluids and may face loosing the ability to drink. He would have to have a gastrostomy fitted, for the protection of his lungs and for a little boy who loves his hot chocolate and coke; this will prove a cruel blow. The added problem is that should surgery further complicate the swallow problems, he may lose the ability to eat as well and be totally nil by mouth for life. Imagine never enjoying the taste of food, not being able to share in family meals or celebrate his 18th with champagne, something that after fighting so long to take each breathe he surely would deserve. Ethan started his new school; he is very settled and extremely happy. He has been chosen to learn the trumpet and is enjoying this very much. He has been a little unwell the last few weeks, his chest gives him a lot of problems, but he will be bouncing back real soon. I would like to thank everyone who wrote to Ethan. He has been a little unwell and we will be responding really soon, but we thank you from the bottom of our hearts. Thank you for being so kind and caring and sending Ethan post. He is doing really well and hopefully the long wait for main stream schooling will soon be over. He is so excited! Hugs to all. A huge thank you to our Christmas elves and sorry for delay. Ethan was denied entry for mainstream schooling and it has been an overwhelming battle for support to gain his place. He lost 6 months in total out of school, but hopefully he will start mainstream very soon. Thank you to everyone who has kept a smile on his little face, you really make all the difference. Just to say a huge thank you to everyone for cheering Ethan up so very much by sending post. You are wonderful. A special thank you to Leita, for her wonderful emails to Ethan, she has brightened his day so much. Ethan made it into theatre and was really brave; he seems to have matured so much of late. However, the news was not good. The surgeon explained that after multiple procedures and failed attempts at reconstruction, his airway is quite damaged now. The scar tissue has formed solid lumps and the collapse itself is quite severe. He felt that a further attempt to reconstruct held a risk of failure. Ethan would have to have another rib graft taken, and be sedated for a week in intensive care, which is a lot for him to go through and it may or may not work. I was then told his surgeon was retiring next month and I would need to find another surgeon I felt confident in to do this procedure, so we agreed that the best for Ethan was getting into school. He has already lost a whole term and the new term is fast approaching. If he had friends and some normality it would help him regain his confidence and be more positive about another major procedure, so I am waiting until January to see if this happens. The bad news means that if this operation failed, Ethan would be tracheostomy dependant for life. We did manage to go to the national history museum though and he loved that so much. He has recovered speedily from his recent ill health and is currently bouncing off walls once more. We send love and thanks to all his Post Pal friends out there. They are amazing. Ethan is not currently attending school as he was refused entry to mainstream school. This is because the health authority stated they did not have capacity on a children’s airway support team to support him and also he does not meet criteria. He is currently home and really low and bored. He has no friends as yet as due to the tracheostomy he needs 1/1 care 24 hours a day and playing outside is not the same with mum. Kids don’t want to play with him, so he’s really lonely. He has surgery due on the 24th October – it is nothing major but he is a little nervous, otherwise he has been doing really well. A huge thank you for making Ethan’s day with lovely cards. He gets so excited when he receives mail. Ethan has started main stream school one half day per week. He starts full time in September, leaving behind the many friends and happy years at his special needs school. He is extremely excited about this move. He is due to attend Great Ormond Street Hospital for exploratory surgery on July 15th. We are travelling down the day before for a surprise trip to the National History Museum to see the new fossil they have on show. I can not wait to see his little face and will share the moment caught on camera when we return. Thanks to all who brightened Ethan’s days with post. He adored his dinosaur cards and gifts very much. Huge thanks to Wendy for a fantastic home made card for Ethan and also Jesse and Jasmine. You are all awesome people. Ethan has rejoined Post Pals. After a third failed attempt to mend Ethan’s airway he became very frightened of his tube ever being removed. He is working closely with a child psychologist for confidence and he is also preparing for entering a main stream school in September. The special needs school was fantastic, but he really needs the teaching of a regular classroom. He still adores his dinosaurs, enjoys playing his x box 360 and Mcdonalds. I have promised Ethan a dog once his airway is mended, hopefully encouraging him to co-operate with further surgery. He is growing into a lovely young lad, he is doing very well. Jesse is preparing for his exams as he leaves school in May next year. Jasmine is becoming quite a little lady, loving her pop music and make up. They grow so fast! I would like to say thank you to post pals, the Halloween cards were fantastic. Thank you also to the wonderful people who put a smile on Ethan’s face, priceless! Thanks so much. Ethan has been doing very well health wise, we have had some moments that have caused not just concern, but smiles. Ethan has been experiencing the stuffy nose, he never really had this before as his breathing was done via the Trache tube, but he managed to cope quite well and is due for another theatre admission on May 10th 07. Ethan has enjoyed his mail this month; I wish to thank everyone for their thoughtful and imaginative post. I love to read his letters with him, Ethan gets quite anxious to hear the next news from his post pal, so thank you. I can not tell you just how much the craft and stickers make Ethan’s day; he has spent many hours creating and playing, thank you all. Ethan has been fascinated with dinosaurs since he was around 18 months old, this has been his passion and Ethan continues to keep this love alive. He wants to be a paleontologist when he is grown and he keeps all his dinosaur mail in a special collection. I wish to say thank you for the wonderful additions Post pals have made, God Bless and thank you, Julie (Ethan’s mum). Ethan is going into surgery at GOSH on March 1st. He has had some bad chest infections over the last few weeks, but he is a fighter and he has bounced right back. His smile just keeps beaming. Thank you post pals for all your support, we love you lots. Post pals are the most generous and loving pals in the world, you send such warmth and good will; it is heart strengthening, thank you. Thank you to Julie and Alan, Ethan adores your mail; your support is so much appreciated. Also to Kate whom my elder son has gotten very fond of, he smiles from ear to ear when she writes him. God bless all of you. Also huge thanks to the US Army people, Ethan thought your cards were so cool, he sends a big hug and grin to you all. I include you all in our prayers, thank you. Julie and Family. Ethan had a wonderful birthday, thank you for the cards etc. He is back home now and doing extremely well, thank you all for the loving care and support. Ethan had his surgery on the 10th and it went well, but he developed tonsillitis the following day and his throat was really tender and sore. After antibiotics he got better and we came back to the local hospital and all went well until Saturday, when the airway collapsed in on the tube. He has respiratory distress and a stridor and is awaiting urgent transfer back to Great Ormond Street. He is on humidified air 24 hours a day and confined to a bed. The T tube is being used like a trache tube to maintain an open airway, so back to theatre ASAP. Poor little lad, will update as things unfold, thanks to all for messages and cards of support, I have put a poster for post pals up on a hospital wall in the parents room 🙂 Hugs from Julie and Ethan. A huge thank you to all, Ethan sends big hugs. He is having his operation on the August 10th. Ethan is currently spending every night in hospital due to the removal of his nursing team; he does not meet their criteria after 3yrs, ventilated kids only! He is to undergo surgery on August 10th at GOSH. Ethan loves his post and especially now, as it cheers him up no end to have a letter/card when he comes home from the ward. Thank you to all, and thank you for the cards/gifts sent to his siblings too, what fantastic people you all are. As usual the post pals have been wonderful this month, many thanks and God Bless you all. On behalf of Ethan and his family, many thanks for all the lovely letters, cards and support received, God bless you all. I would like to thank all friends who have been very supportive and kind to Ethan, especially Liz, she’s a star! Ethan is so excited for Christmas; he has made his list already, and lists for all his toys too! He is going into hospital next week to have his top teeth removed in theatre, unfortunately when he was last in surgery the bronchoscopy broke all his top teeth, but the new teeth will come in and all will be ok.
Ethan loves his post, and sings the song from blues clues, I just got a letter, ha ha, I can’t thank your team enough for the beautiful letters, cards and gifts. Bless you all, hugs from Julie and Ethan and family.